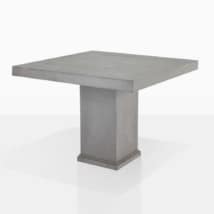 Modern, chic and sturdy; the Blok Square Concrete Tables are an ideal choice for the contemporary home! Part of our Blok range, which exemplifies a superb modern vibe defined by thick table tops and simple, modular designs that are selling out at our warehouses! Our new Blok Square Concrete Table comes in 2 different sizes. 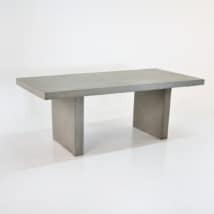 Modern, bold and durable dining tables for indoor or your outdoor dining space. Mix and match our A-Grade Teak fixed dining chairs for a natural and modern vibe. 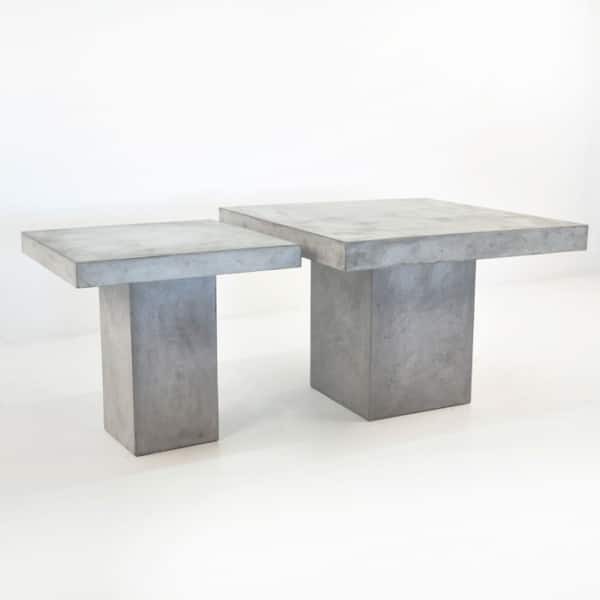 These Blok Square Concrete Tables sport a thick slab-like tabletop and a pillar-like base with an incredible mottled, brushed concrete look. It’s so raw and stunning, you’ll want to have it indoors as well as out! Teak Warehouse’s Raw Concrete is made with resin and fiberglass; a composite that means it is lighter and yet lasts longer than 100% concrete, while still retaining the look, feel and behavior of concrete! When buying this product bear in mind it is ideal for outdoors but will change outdoors; changing color when rain or water falls on it and developing hairline cracks in extreme heat. None of this affects the integrity of the frames but adds to the character of the piece. Raw Concrete is easy to care for, you can opt to seal it with a concrete sealer if you wish to retain the color as you see it and to protect from any nasty spills. Otherwise it is just a case of wiping it after you use it! Just like any table. 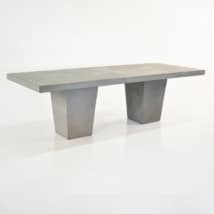 Check out other items in the Blok range for more ideas and options in the raw concrete. As well as this fabulous, modern material; Teak Warehouse also hosts our signature A-Grade Teak, #316 Stainless Steel, Viro® All Weather Wicker, Sunbrella® and mesh fabrics, and Reclaimed Teak. Peruse our website and call us today to discuss different options. Purchase one of our 31 inch Blok Square Concrete Tables and complement with two aluminium and wicker low lying dining chairs for a mid century style that you will love! Upscale to the 43 inch and place 4 All Weather Chairs in your choice of sandstone, stonewash or java around the table, making a sumptuous setting you can enjoy after work drinks or a casual meal at! Keep it concrete with the addition of Square Raw Concrete Stools in the midst of your garden creating a beautiful collision of soft and hard lines. 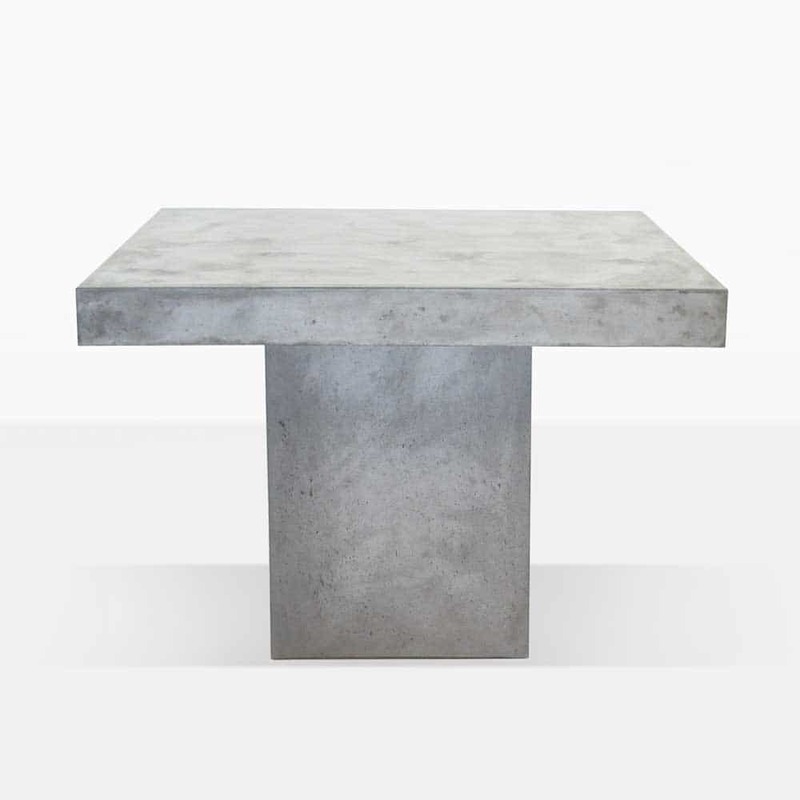 The Blok Square Concrete Table also suits indoors! Bring in as an alternative to a regular kitchen table, and place our metal mid century side chairs around for a fun, fresh industrial look! We have sold these in high numbers for commercial projects too! Line up several in a magical courtyard for a splendid collision of fancy garden dining with a contemporary flavor. Teak Warehouse has been in business over 20 years, we are proud to ship nationwide, providing America with an amazing range of patio, outdoor and commercial furniture to help us extend our living space to the great outdoors in style, keeping strong pieces with excellent architecture. We are confident that we will find something that you will love. 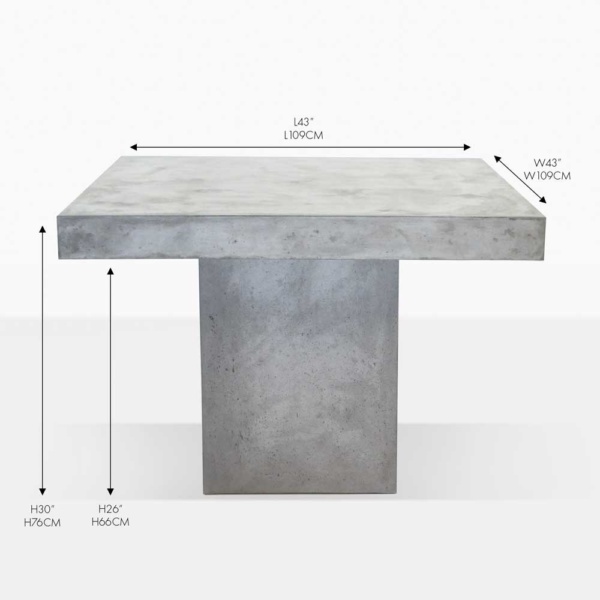 The Blok Square Concrete Tables are sold separately. Scroll down to see the size options. 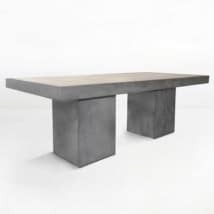 Modern, bold and durable dining tables for indoor or your outdoor dining space; the Blok Square Concrete Tables – the next addition to your home.